The American Association for Cancer Research held two community events this week aimed at engaging the public in the AACR’s ongoing mission to prevent and cure cancer through advances in research. On Monday, Oct. 12, Pat Morin, PhD, senior director of scientific review and grants administration, discussed “Cancer Science: The Quest for a Cure” as part of Science on Tap, a collaborative series of talks sponsored by some of Philadelphia’s leading scientific institutions: the Academy of Natural Sciences, the American Philosophical Society Museum, the Chemical Heritage Foundation, the Mütter Museum of The College of Physicians of Philadelphia, and the Wagner Free Institute of Science. This month, the AACR presented as a guest of the Mütter Museum. 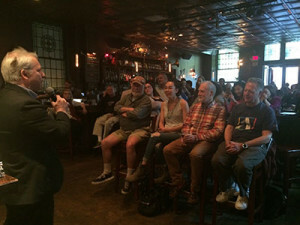 Dr. Morin discusses the history of cancer science at Philadelphia’s Science on Tap. Morin led the audience through a timeline of advances in cancer research, from Sidney Farber’s development of chemotherapy in the 1940s to the targeted therapy that has transformed cancer care in the past two decades. The latest frontier – immunotherapy – highlights the importance of ongoing research, even when success seems elusive, Morin said. The following night, Shawn M. Sweeney, PhD, associate director of translational research at the AACR, manned an exhibit at the Franklin Institute’s Science After Hours program. This was the AACR’s first appearance at Science After Hours, which features experiments, demonstrations, games, and innovative and engaging science targeted at adult museum guests. As part of the museum’s October theme, “Superheroes,” Sweeney cast the immune system as the superhero of the human body. Robed in a superhero cape, he showed visitors how the immune system is equipped to recognize cancer, how cancer often hides itself from the body’s self-defense mechanisms, and how cancer immunotherapy can successfully unmask cancer to yield positive results for many patients. Sweeney’s display featured a “mutation station,” in which guests picked cards that illustrated the various ways in which genetic activity can go awry; engaging graphics that showed the specific qualities of the body’s immune system cells; and demonstrations of the ways various immunotherapy drugs are working to fire up the body’s ability to fight cancer. Sweeney pointed out that cancer is a formidable opponent, and that it took about 100 years of research to gain enough understanding of the immune system to enable the development of today’s therapeutics. The AACR is proud to present these events and looks forward to the next opportunity to engage the public in our ongoing conversations about progress in cancer research.